Author Yuchi Yang has extensive education and experience to back up the information in her book, “A Food Guide to Lowering Blood Triglycerides.” She is a registered dietitian with the Academy of Nutrition and Dietetics, and she received her Master Degree in Nutritional Science from the University of Connecticut. 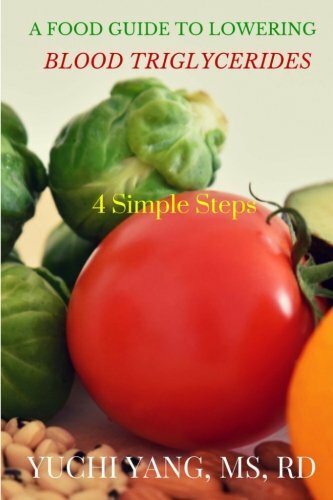 Her food guide offers four simple steps to lower blood triglycerides. These are directly related to the proper consumption of sugar, carbohydrates, fats, and fiber. While you would think that this process would be relatively simple, most people need to educate themselves on what they are putting into their bodies. They also need to break bad habits. In this small book, Yang provides the tools to help educate the reader in layman’s terms, with worksheets to help readers track their consumption and work on lowering or increasing the numbers as needed. At first glance, I thought the guide would be too short to provide an adequate amount of information to really help someone, as it is only about seventy pages. However, after reading the text and reviewing the information presented, I felt it would be the perfect tool for someone who needs to work on this goal, especially a person who wants to lower their triglycerides without medication. Everything that is needed is within these pages, and there are also resources included that will allow the reader to gather more information if necessary. Because the text is in a workbook format, in that the reader can fill out information in the charts, I would suggest that each person, in a group or a family, have their own book. I had two main reasons for reading this book. The first is that I have friends whose triglycerides actually run from the 300s to 700s. I wanted to be able to help provide them with information that would benefit their health. The second reason is because my triglycerides actually are in the 60s. Yes, the 60s, and I wanted to figure out what I was doing right! Either way, I have been armed with a lot of information, after reading “A Food Guide to Lowering Blood Triglycerides” by Yuchi Yang, and I am very pleased to see that I am on track, and plan on staying that way!